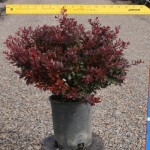 A low dense shrub with deep crimson foliage. The foliage colors best in full sun. The fall color is a rich red. The leaves are small, and clustered thickly on the stem. Tiny, bright yellow, waxy flowers appear in spring. Prefers full sun and a moist, well-drained soil. Responds well to light pruning if needed.